I am 75 years old, and have been a skeptic on the subject of religion for most of my life. I have arrived at the point where virtually all things requiring faith in supernatural things, seems just plain silly to me. The garden of Eden thing, makes so little sense when analyzed with a logical mind that it is irritating to me to even think about it. The Jesus story, is so patently, a blood sacrifice to an imaginary god story, and even dumber than many of the, sacrifice to god stories, that preceded it, that I want to scream. It makes no sense folks, the whole Idea that the creator of the universe would need, or want a sacrifice to himself is nothing more than an insult to whatever brought about the big bang, assuming that "It" could be insulted. The way I see it, is that the human animal is so insignificant in relation to many other things in the universe, including other forms of life that theoretical scientists postulate as having a very high degree of probability of being "out there", that to assume that we are special to whatever created it, and that it was created just for us, of is beyond arrogant. It is specious reasoning to an extreme. We are special, but not to an imaginary god, sitting up somewhere in the sky, but to LIFE ITSELF, and living. We are special, but not to an imaginary god, sitting up somewhere in the sky, but to LIFE ITSELF, and living. We have been blessed with enough intelligence to see and create beauty, more so than any other life form on this planet. To waste what took 5 billion years to evolve in us, and spend our lives being afraid and feeling guilty and dirty, just because a bunch of sheep herders two thousand years ago invented a cult, is the true sin. We owe to the millions of people who were tortured and killed by these cultists, a dedication to rejecting all of the made up stuff they are still selling, and not giving power to popes, preachers, shamans, and their ilk, ever again. So I'm saying to all of you clowns, with your special clothes, your robes, your collars turned backwards, and your funny hats, to keep your dramatic speeches about stuff you honestly know nothing about, to yourselves, and get a job just like the rest of us. 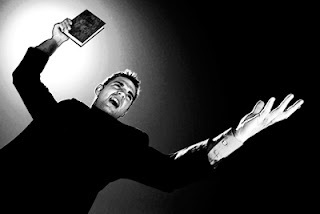 ExChristian.Net: Get a Job, preacher man!